I’ve been part of three different writing groups now, and there are a couple of fundamentals that always get bandied about; point of view (pov) and tense. When I started writing, I was all over the place on both of these things. Wildly. I’ve gotten better. I still do random tense shifts, but my pov’s have gotten much more solid. That’s not to say I don’t still wander in and out of the lines, only that the gaps between those incidents are greater. One of the things that I would get called to the carpet for was my tendency to have pov shifts happen in a single chapter without any sort of visual breaks or delineations. People used words like ‘jarring’ to describe their reaction when they’d come across these moments. They also said it, ‘took them out of the story’. A larger problem has been this sense that I wasn’t doing anything wrong. That stems from those early days dipping my toes into writing, when I would emulate what I was reading. Specifically, I’ve had it in my head that I saw random pov shifts in published novels. Only I couldn’t point to them and say, “Here! Look! This is what I’m talking about.” So, when people would harangue me – at first, I defended myself. But as time went on, I stopped doing that. I adjusted. I changed. No more random pov shifts. First Person means you’re in one character’s head, seeing everything through their eyes, and can know only what they know or see or feel. The Harry Dresden books from Jim Butcher are all First Person, for example. Third Person means we’re seeing everything from an outside point of view – not through the actions of any one single character. However, you can actually get into different character’s heads and we can know how the characters feel and what’s going on, when we’re in Third Person. Objective POV shows us what’s happening in the story through action and dialogue, but we never get into anyone’s head. We’re detached. Omniscient POV is a narrator who knows everything, can be in every character’s head, see everything going on in the story. Omniscient Limited brings the narrator down to a single character throughout. No jumping from head to head, but that single character – we get everything they know and see and feel, but only that one character. Now, this list is, by no means, comprehensive. There are far more detailed explanations elsewhere. Seek them out if you wish. Back to my writing. 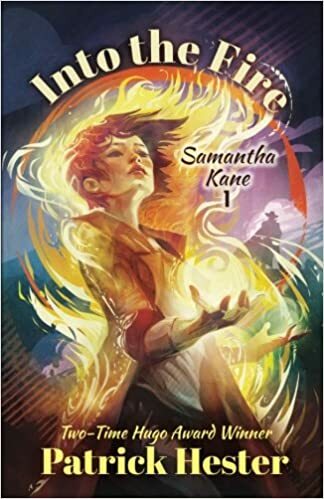 With Sam Kane: Into the Fire (and the subsequent sequels), I went full on First Person. This eliminated (in my mind) the chance to screw up the pov. This still leaves tense, but that’s another post. With my Epic Fantasy, I wanted multiple pov characters and went with Omniscient, though some people think it could be Third Person (it’s not). I jump from character to character, but usually stick with one pov character per chapter (unless I need to jump, in which case I break the chapter into sections). Same with my Space Opera. Doing it this way – using chapter breaks (and sections), makes for a smoother, easier read. Which brings me to last week and the point (mostly) of this post. Some muggle friends were talking about a book. They made it sound very exciting. It’s a ‘thriller’, which I would categorize as ‘general fiction’. Really, it’s more like ‘spyfy’. Whatever. The muggles did what any good word of mouth is supposed to do – they talked the book up and made me want to check it out. So I downloaded the ebook to my Kindle and did just that. In the first first chapter, the pov shifts from the first character, to the second, and then back again. No breaks. No anything to tell me we’re switching. We are just in one person’s head, and then the other, and back again. A couple things come to mind. First – when I noticed this kind of pov shifts before, it was in these types of ‘general fiction’ books. Second – could this be the Omniscient pov discussed above? Or Third Person? (I’m not sure, actually. Take a look at the images and let me know what you think.) Third – obviously this sort of pov shift is completely acceptable in this kind of book. I mean, the editor didn’t change it. The author didn’t change it. And the book is currently sitting in the #1 spot in the NY Times Best Seller list for Fiction, so the readers don’t have an issue with it. Fourth – why do genre readers freak the hell out? I wouldn’t describe it as jarring so long as I knew whose head I was in. What has bothered me in the past are some books that did not indicate who was speaking in multiple-person (more than 3) conversations. 96% of the time I could figure it out fast enough, but every once in a while I had to stop and reread some sections to deduce who was speaking to whom.